The four days I spent at the Consortium of Multiple Sclerosis Center’s annual meeting was, well, simply incredible, unbelievable, surreal, interesting and amazing. I stepped into the lobby of the Gaylord Hotel, walking along their red carpet that led me past a 19 story glass atrium wall overlooking National Harbor on the banks of the Potomac. With every step my heart beat faster, knowing what was about to begin. I was getting closer to meeting the brilliant people I call my rock stars, the ones who are committed to making a difference in the lives of those living with multiple sclerosis. The 30th annual Consortium of Multiple Sclerosis Centers (CMSC) convened last week at the Gaylord National Resort and Convention Center. It’s always an honor to attend this event. I get the chance to hobnob with top healthcare professionals and researchers from around the globe who are there to offer the latest information, strategies and areas of exploration for attendees to learn and bring back to their practice. From early morning through early evening each presentation has a united theme: How to improve the lives of MS patients. One word, more than any other, was spoken: Hope. But what exactly goes on at this conference? In the next few weeks I’ll be writing about what I learned at the sessions I attended. I’ll also be sharing interviews I conducted with some incredibly dedicated professionals. Daily Press Conferences – As part of the press corps I had the unique opportunity to be in the Press Room to meet key speakers prior to their lectures. What’s it All About? 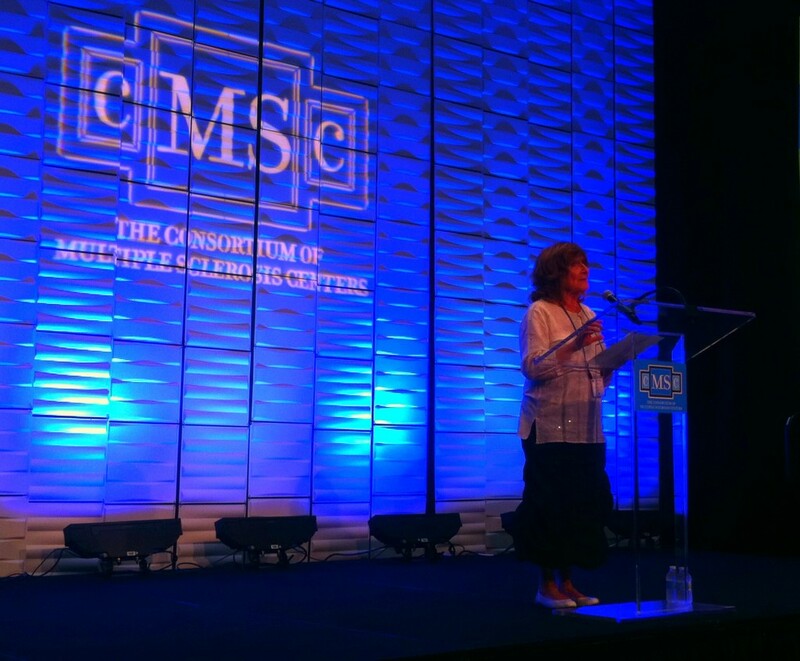 There are pages and pages of lectures and symposiums to choose from, plus professionals can obtain CME (Continuing Medical Education) credits that are offered through CMSC. The list is impressive and I overheard many attendees mention how inclusive CMSC is by offering such a wide array of subjects. Exhibit Hall: There were 72 exhibitors that included pharmaceutical companies, MS organizations, MS-related publishing companies, MS databases and registries, pharmacy innovations, apps, websites and unique online programs for MS patients, cooling and mobility manufacturers and information about adaptive yoga classes. A special shoutout to the work being done by The Veterans Affairs Multiple Sclerosis Center of Excellence and United Spinal Association. Three booths I enjoyed speaking with were MS-GO Event Calendar (a free service for local events, support groups and meetings. I am signed up in New Jersey and receive emails listing local events), Cure Fund (a patient advocacy organization) and MotherToBaby (a non-profit organization answering questions about medications and pregnancy). I spoke to a few about their work and they were impressive. The FCMSC works hard to encourage medical students to choose MS as their main focus. We need more of them to choose this as their specialty. Fingers crossed!